We are excited to launch a blog series, “Featured Fil-Am,” in which we will highlight a Filipino/Filipina-American who is making an impact on our community. We will share our “interview” with each person in hopes to bring awareness of his/her amazing work. Q: Where do you currently live? Where are you from? A: I currently live in San Diego, but grew up in Washington State. Q: Tell us a little bit about your cultural background. A: I’m half Filipino but was raised in a typical American/white household. My dad is Filipino and is from Iloilo City, Philippines. My mom is part Slovenian, Irish and French(?) and grew up in California. It definitely makes me a very unique mix of different cultures. Growing up I had always longed to know more about my Filipino side and oftentimes had this feeling like I was missing out on the “Filipino American experience,” not even sure what that meant. A few years after college I was coincidentally assigned to the Philippines as a Peace Corps Volunteer and found myself on a journey of self-discovery with a unique opportunity to learn more about my roots and identity as a Filipino. Living in the Philippines for three years as a volunteer was such a transformational experience that I wrote a memoir about it called Somewhere in the Middle: A journey to the Philippines in search of roots, belonging, and identity. In the book, I reflect on my struggle to identify with both cultures at the same time, feeling caught in the middle between two very different worlds. Q: What do you want others to know about the Fil-Am/Filipino culture? A: Filipinos are one of the most hospitable people I have ever encountered. In the Philippines, I’d get invited to random people’s houses for coffee or to share a meal, or a random stranger would volunteer to accompany me to my destination if I was lost. Everyone would go out of their way to welcome me into their homes and share whatever they had. And I loved the smiles of the people on the street as I passed by. They’d give you a big smile, wave, and say hi and I always marveled at how easy it was for them to be so friendly to strangers. In terms of Filipino American culture, I have come to realize that Filipino American identity is actually a much more diverse experience than people realize – and that’s a good thing! I grew up thinking there was only one type of Filipino American and that if you didn’t experience the same things or weren’t able to relate to that one type, it meant you weren’t really Filipino American. But my experience of living in the Philippines, as well as reading/writing about Filipino American identity over the past few years, has taught me that the term “Filipino American” can mean a lot of different things. One’s perspective of Filipino American identity can be shaped by various factors such as where you grew up, the friends and family you were surrounded with, your economic background, the demographics of your hometown, or even how you saw yourself in relation to others. Even depending on whether you’re a 1st generation immigrant, a 2nd or 3rd generation, or even what some now define themselves as a millennial Filipino American can affect how you identify yourself and how you view Filipino American culture. Some feel much more connected to their Filipino side and some much more connected to their American side, and most are somewhere in-between. It’s important to recognize that we all have diverse experiences and that each is valid and at the same time we can still be connected through our common Filipino roots. Q: What do you currently do or have you been doing in hopes to contribute to the Fil-Am/Filipino community? A: One of my passion projects is running a Filipino American lifestyle blog called Halo-Halo, Mix-Mix: Discovering the Filipino American Identity. I chose the subtitle to include the word “discovering” because I have come to understand that my identity of being Filipino American is an ongoing learning experience and I wanted to reflect that fluidity in the title. The original purpose of the blog was to share more about Filipino culture for those who want to connect more with their roots and heritage. But in the last year or so I have come across so many Filipino entrepreneurs that are doing amazing things and I love helping to promote these businesses and improve their visibility. The best part about this has been developing an awesome community of friends all over the world from Australia to Canada to the Philippines and all across the U.S.
Having now published my memoir, I hope to be able to inspire others who are searching for their roots to seek out their own journey of discovery and hopefully write and share their stories. Each of our stories matters and if we don’t tell our own stories, the world will be missing out on something great. In the future, I would love to be able to host memoir writing workshops to help others craft their story in a creative and fun environment. Q: What or who is your inspiration behind what you do? A: I feel very inspired by the Entrepinay community which is a group of Filipina entrepreneurs who connect with one another for networking, collaboration, and sisterhood. Just seeing all the amazing things they have accomplished inspires me to keep on pursuing my own dreams. Q: Tell us anything else about where to find samples of your work. A. Be sure to check out my book Somewhere in the Middle, and let me know what you think about it! It’s available on Amazon in both the paperback and Kindle version. You can also purchase it at any major online retailers such as Barnes and Noble or Apple Books. Feel free to also check out my blog for posts on Filipino culture, food, travel, books, and identity. You can also read about my journey in the article “What are You?” featured on the Filipino American Voices series. 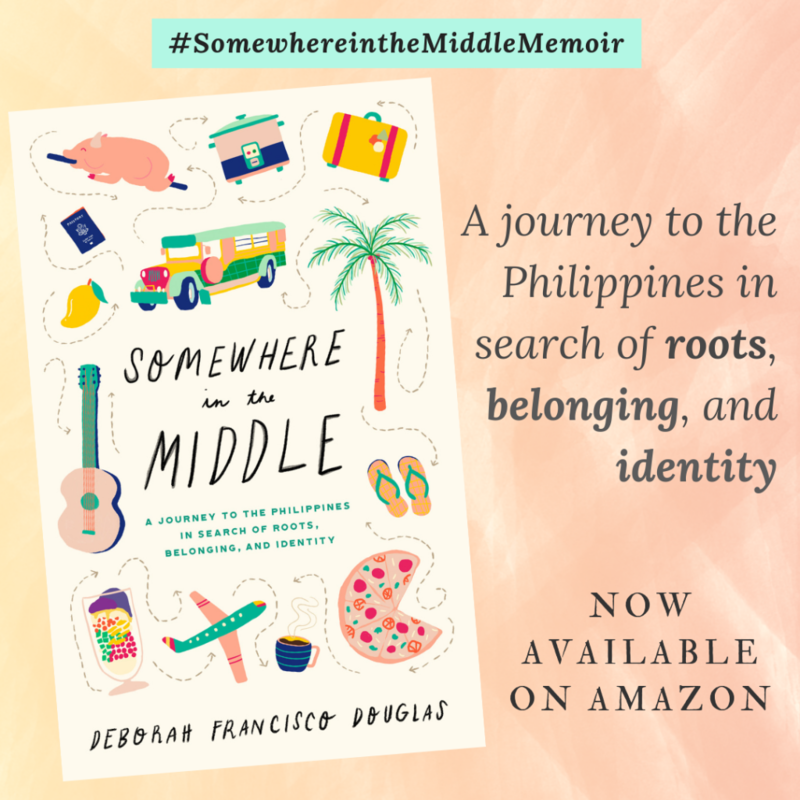 Next week you can enter the giveaway of an autographed copy of Somewhere in the Middle, hosted by This Filipino American Life Podcast on April 10-14. Check out the Instagram accounts @tfalpodcast and @halohalo_mixmix for details. In June, Deborah will be speaking at an author event hosted at Philippine Expressions Bookshop in San Pedro, CA on June 29 from 3-6pm. Please come say hi if you are in the area! 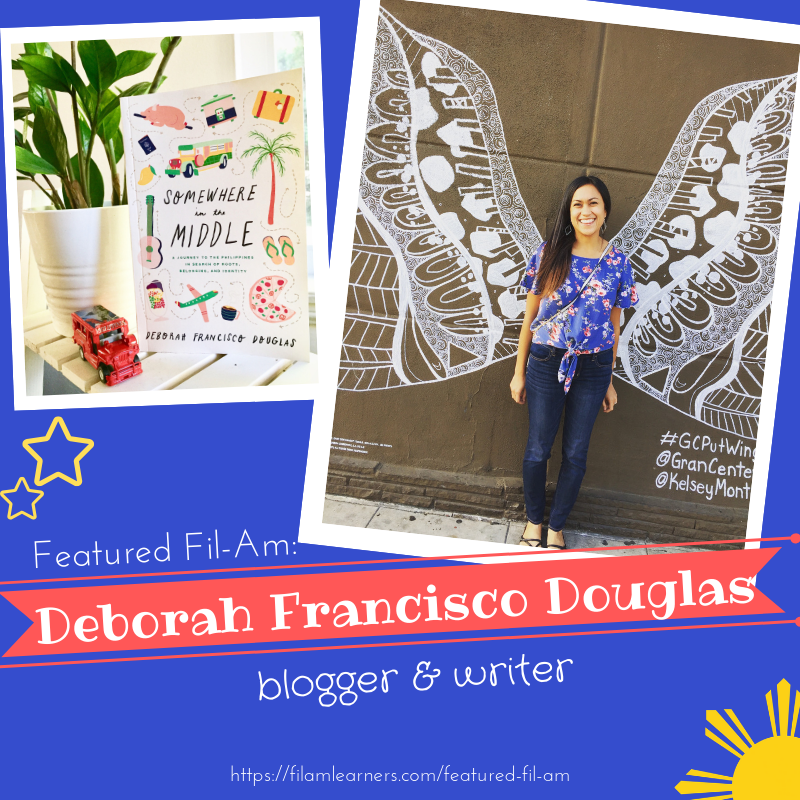 Deborah Francisco Douglas is a writer, blogger, dreamer, and adventurer. 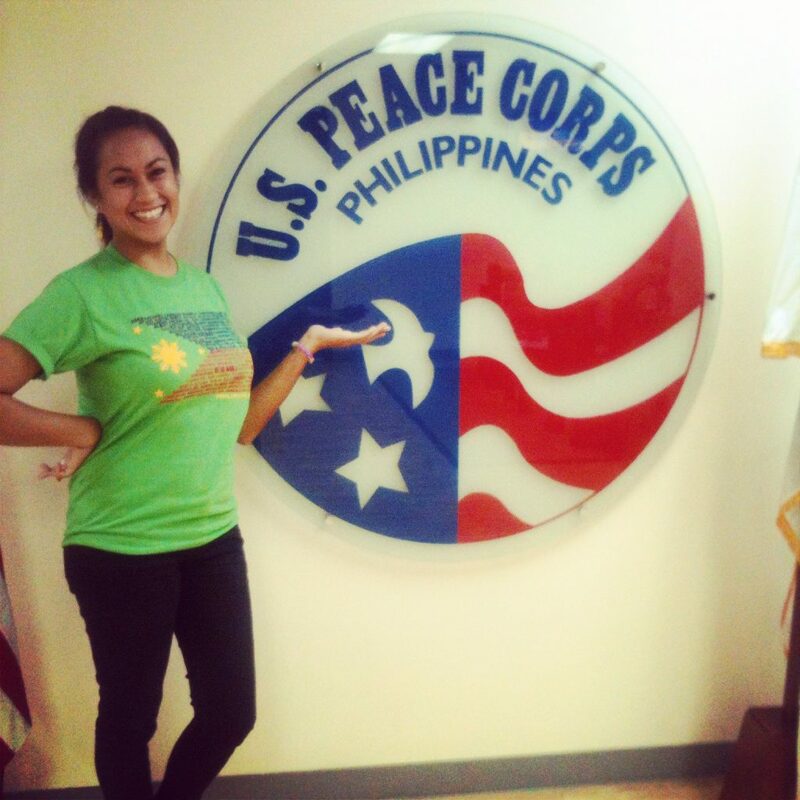 She served three years in the Philippines as a Peace Corps volunteer (2011-2014) working on community development and youth outreach programs. 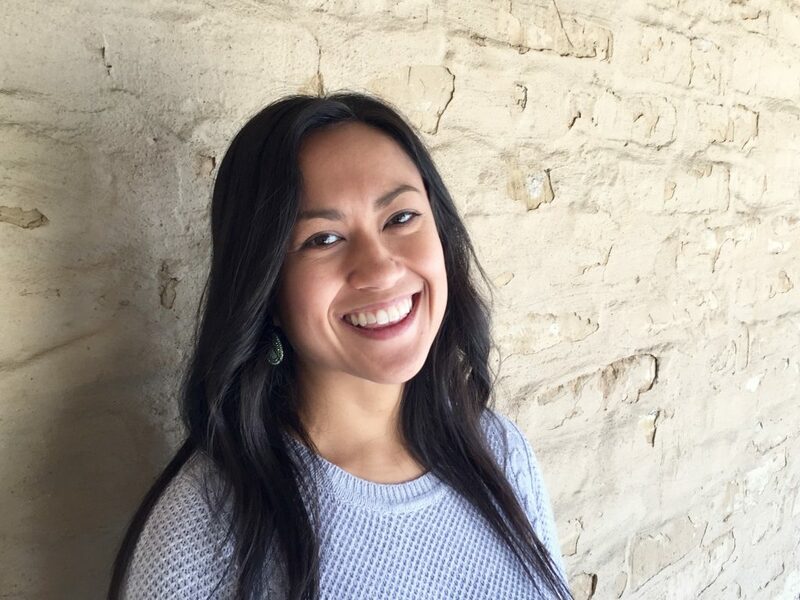 As a Filipino American, Deborah’s volunteer experience abroad connected her to a culture she had long desired to understand. When she returned to the United States, Deborah created the blog Halo-Halo, Mix-Mix – Discovering the Filipino American Identity, as a way to share her love of Filipino culture. Deborah lives in sunny San Diego and loves hiking, reading, walks on the bay, and lazy mornings drinking coffee. Somewhere in the Middle is her debut memoir. Visit her blog at http://www.halohalomixmix.com to learn more about Filipino culture, travel, and lifestyle.